Facing South, overlooking the sea. 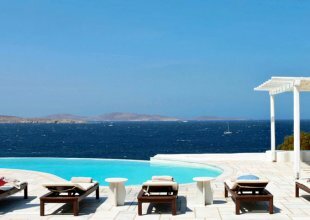 Mykonos Town is 10 km from the villa, the closest shop is 4 km, and the airport is 12 km away. The nearest beach of Lia is 1 ½ km from the property. 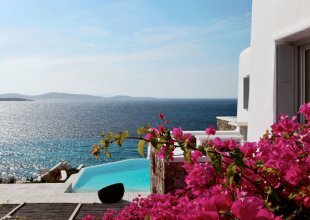 Aegean Oasis enjoys a tranquil position in the area of Lia Beach, well know for its peaceful setting and good dining options. The property is part of a large estate accessing a small bay just below the villa, ideal for mooring a yacht. Lia is perhaps one of the quieter areas of the island close to the traditional town of Ano Mera. Further to Lia Beach also the beaches of Kalafati, Elia and Kalo Livadi are within reasonable distance from the house. The property’s private pool is most certainly the main standout feature of the outdoor area. Its particular design and lagoon style structure are sure to amaze guests throughout the extensive 270-degree water surface with a marvelous infinity edge blending into the landscape. Poolside relaxation options are various with elegant sun beds, shaded area with large comfortable cushions and a unique sunken gazebo boasting. The formal outdoor dining pergola completes the property’s outdoor spaces. The house shows a beautiful contemporary all-white decor with an impressive collection of artwork and a grand piano in the living room. Massive rocks reveal the island’s natural environment used as a backdrop in the formal indoor dining area and well appointed modern kitchen. The room grants easy access to the outdoor dining area through French doors opening directly onto the front pool terrace. 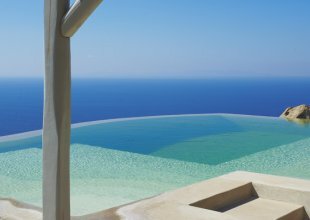 Aegean Oasis bedrooms are divided amongst the three levels of the property. A must to mention is that the master bedroom has a cave-like shower bathroom. All bedrooms allow access to a terrace while offering extensive sea views both indoors and outdoors and benefit of direct access to the pool terrace.